Selenium WebDriver Is open source software testing tool which supports many different browsers. It Is also supporting many different software programming languages like Python, Ruby, C#, Java, PHP and Perl so that you can create your test cases using your preferred language. Current days, Most popular language Is Java to prepare your software application automation test cases with selenium webdriver. I have written different posts on many different topics for selenium webdriver with java. Bellow given links will take you to webdriver tutorials links pages. 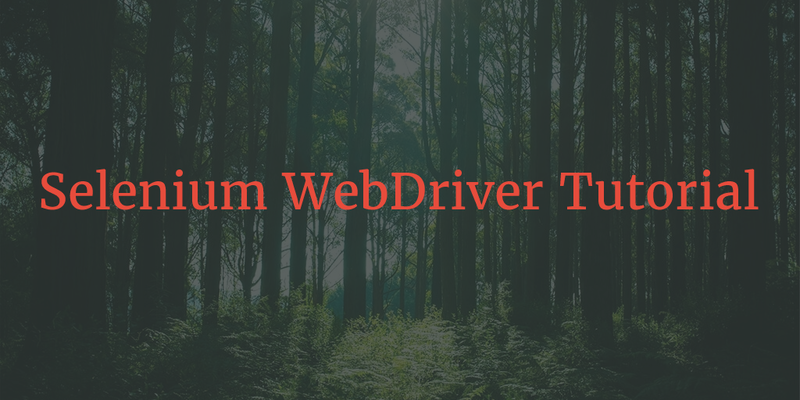 I tried to describe each and every point on selenium webdriver with detailed description. 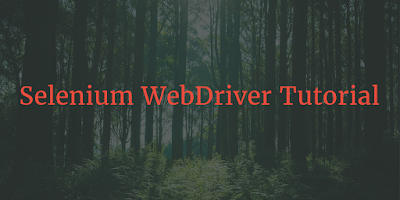 Start learning selenium webdriver from Part 1. These tutorials will prepare you to face any Interview, Prepare you to create test cases for your software web applications, Prepare you to create your own framework and takes you to advanced level In selenium very easily. Start your selenium webdriver learning journey now to learn software automation testing and be master In selenium webdriver within few months. Selenium WebDriver Video Tutorials NEW!! 3300+ Students has enrolled this video tutorials. 300+ Students gives 5 Star reviews to this tutorials. 50+ Students gives 4 Star reviews to this tutorials. Over 183 lectures and 30 hours of content! Very Helpful ....Thanks for your Valuabel information.. Your blog is so comprehensive...Almost everything at one place...You have that real PASSION...! Thanks a ton..!!! The best!!!!!!! keep up the great blog !!!!! Thanks for your valuable information.We are also providing SELENIUM online training. Very Nice...Contains A to Z concepts...Thanks a lot..
Best blog on selenium webdriver.The interview questions and answers and supportive material to them are really enlightening to us.You effort to help QA people is estimable.Keep posting updates. This is best blog ever on selenium webdriver material.Your interview questions on this topic is really enlightening. You effort to help QA people like us is estimable. I am selenium beginner. This blog is really helpful to me. Thank you so much Sir. Like Data Driven Framework, Can you help us in Page Object Model or Hybrid Framework as these are most popularly used these days. please help me regarding above problems. Would be great if you could make another tutorial with WebDriver parallel execution. This is awesome. Thanks a lot. We should be really thankful for this very informative things on Selenium. I really appreciate you for this valuable thing. we should appreciate you hard-work comprising all concepts in single window page. How to do API automation in selenium web driver? Please guide me. Your blog is very good. Thanks a lot. I have got an issue in selenium. Driver commands are not executing in TestNg and after method.Though i have installed TestNg and testNG is add externally thourgh the configure build path. Can you pls. upload an example where the code is not having any error but will find so in the test case? I have been trying to find an answer "why import segment is not showing when I am writing any code"? like if i write "webDriver driver = new FirefoxDriver();" and for this error the import is not showing in the fix list which is so weird. Please guide me in this. I am clueless . The posts are very useful. It would be appreciated if you Could add courses for Infostretch framework. That's Imperative and helpful! Keep sharing such easy to learn tutorial as they somewhere not only help beginners, experts can also get beneficial from them, at some points where they get stuck in resolving out some critical issues.